It provides a way for school boards to save money on their energy bills, allowing them to more efficiently light and heat the school buildings where students go to learn each day. It trains school board members in skills such as negotiation, governance and school ethics – the tools they need to effectively lead the schools. And it offers a welcome, knowledgeable voice on the phone for those boards that need expert legal guidance. “It” is the New Jersey School Boards Association, the century-old member organization that provides training, advocacy and other services to the state’s nearly 600 school boards and dozens of charter schools. The Association offers a myriad of services to its members, ranging from the Alliance for Competitive Energy Services, or ACES, which saves school districts money on electricity and natural gas; to the NJSBA labor relations services, which offer on-site assistance for boards that are negotiating employee union contracts. At an average $12,141 annual dues paid by each board, the Association provides value for the dollars spent. Webster, who is now president of NJSBA, said the Association provides many services to boards that are unavailable – or expensive – elsewhere. “As a state officer, I have come to appreciate the many dues-based services provided by NJSBA that are either not available through other state associations, or are considered expensive optional services, he said. NJSBA earlier this year set out to quantify the value provided by its dues-based services, establishing a task force to study the question “What does my school board get for its NJSBA dues?” The goal of the study, which updated a similar effort undertaken in 2011, was to provide members with a clear picture of the return on their dues investment. The results showed a financial benefit far exceeding members’ dues on an individual and statewide basis. NJSBA Executive Director Dr. Lawrence S. Feinsod pointed out that much has changed since the first study in 2011. For starters, NJSBA’s energy-purchasing program, ACES, provides growing savings each year. NJSBA converted all county programming, and its web-based Accountability Act training, to a non-fee basis. In addition, advocacy before the Legislature and the courts has achieved many important goals. The 2015 task force identified $33,748,364 in value during 2013-14, equal to almost four-and-a-half times the annual statewide dues of $7,714,314. The 2015 Value of NJSBA Task Force also proposed a revision to the Association’s Statement of Core Values, which was drafted as part of the 2011 Value report. The proposed statement emphasizes the Association’s commitment to student achievement, and its belief in the local governance of public education. Founded in 2000, following NJSBA’s advocacy of the state’s energy de-regulation law, ACES saved New Jersey public schools $142.3 million in electricity and natural gas charges during the five school years ending in 2014. In 2013-2014 the 439 participating school districts saved more than $29.3 million, equaling an average savings of $66,763 per district. Policy-setting is a school board’s primary responsibility. For more than 90 years, NJSBA has provided a wide range of policy services to boards, at no additional cost. This helps boards formulate or revise policy to ensure they comply with federal and state laws and regulations. Unlike NJSBA, many school boards associations in other states charge for services such as policy updates, wellness checks, development of job descriptions, and access to the Critical Policy Reference Manual. Private vendors also charge fees. 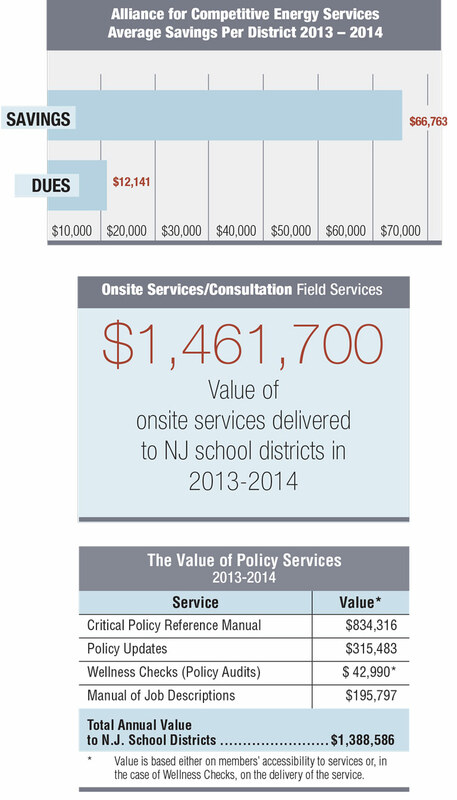 In 2013-2014, NJSBA field services representatives provided on-site, dues-based services to local districts on 1,244 occasions, helping boards sort through questions and resolve issues related to school governance. Associations in several neighboring states charge for such services; based on their fees, the total yearly value of comparable onsite consultation by NJSBA totaled $1,416,700. Representing the community in contract negotiations with employee unions is a key responsibility of local school boards. At no additional fee, NJSBA offers on-site labor relations assistance and consultation to help school boards attain their goals in the complex and often difficult process. NJSBA offers a wealth of database information, plus expert teacher contract analysis, salary guide services and more. Based on rates charged if boards were to hire outside experts, the value of these services is $771,216 per year. The long-term financial benefit for boards – through negotiating a more favorable contract – is even greater. Public school board members are required by law to receive training in how to govern the schools. Providing such training is NJSBA’s “bread and butter;” within a three-year cycle, virtually every New Jersey school board member attends NJSBA-developed training that provides information and resources they need to be effective board members. Association training also supplies research and data on ways boards can help advance student achievement through effective governance; helps boards avoid costly mistakes; and guides them on compliance with the law. In addition, since 2012-2013, NJSBA has offered professional development, toward Board Member Academy Certification, through the state’s 21 county school boards associations, at no additional cost to boards or members. Some 3,957 members attended in 2013-2014, adding up to $174,108 in value, based on the $40 per-person price that was charged prior to 2012-2013. NJSBA’s legal staff provides training to local school officials and board attorneys; advocates for boards through “amicus” participation in cases of statewide significance; conducts research and provides districts with information on statute, regulations and case law affecting public schools. NJSBA attorneys are experts in the complicated and always-growing area of education law, and are available via direct telephone access, with no hourly fee charged, to assist local boards. The services provide both an immediate and long-term benefit to school boards. In Trenton, NJSBA is “watching the backs” of its members, advocating the interests of local school districts before the state Legislature, executive branch, state Board of Education and courts. This advocacy, which benefits all members on a statewide basis, involves researching issues, addressing state and federal officials through direct outreach and testimony, and more. Examples of successful efforts include attaining a hold-harmless provision in the state School Construction Assessments, that saved districts $14.8 million over two years; successfully pushing back efforts to restrict the ability of school districts to subcontract non-instructional services; helping secure a veto of legislation that would have provided tenure-like protection to non-teaching staff; and more. View additional charts including the value of professional development training, NJSBA dues-based services, ethics/accountability act training, the value of NJSBA legal information services and savings to districts through NJSBA advocacy efforts.